The plantar fascia is a thick fibrous band of tissue originating at the bottom of your heel bone and extending along the sole of the foot towards the toes. When the plantar fascia is overly stressed, such as in cases of long periods of work-related weight bearing, pain can usually be felt centered under your heel. One of the most common complaints is pain and stiffness on the bottom of the foot during the first steps in the morning. 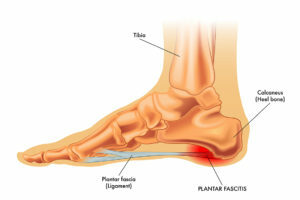 Often plantar fasciitis will go away on its own, but can take 12-18 months to go away if it does at all. This can be very frustrating to patients. A diagnosis is usually made based on a clinical exam. There are several non-surgical options of treating this condition, including self-stretching, physical therapy, night splints or orthotics. Extracorporeal Shockwave Therapy (ESWT) is also highly effective at relieving pain and healing the area much quicker, showing excellent results in 80-90% of patients in 6-8 weeks. This is an excellent non-operative tool to consider. Dr. Gupta can also perform open and endoscopic release of the plantar fascia in patients who non-operative treatment has failed. Copyright 2018 EO & SM. All rights reserved.